Patented MVP bolt designs that accept and feed from standard AR-style magazines. For ultimate in flexibility, the 7.62mm NATO models accept both M1A/M14 and AR10-style magazines (LR308/SR25). Also offers a long range OD green pillar-bedded stock with push-button adjustable comb with a rubberized Mosscote™ cheekrest, patented LBA Adjustable Trigger (3-7lbs), oversized bolt handle, and Picatinny rail. All barrels are threaded for suppressors or muzzlebrakes and come with a protective thread cap. ..
A true AR platform tactical rifle with a 16" chrome lined and phosphate coated barrel (superior corrosion resistance), and a 7075-T6 aluminum forged lower receiver. 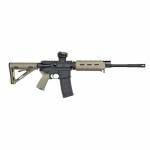 FDE Magpul MOE forend, grip and collapsible stock. 5.56 NATO Direct impingement gas system 16" Barrel 1:7" Twist Trigger weight 7.6lb Overall length: 32.5 - 35.6in (collapsable stock) Overall height 7.8 in Weight: 6.7lb .. 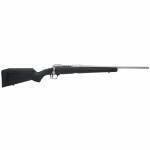 User adjustable AccuTrigger, Adjustable lengtrh of pull, sprial fluted bolt, rugged syntetic stock, detachable box magazine, 20inch stainless barrel. 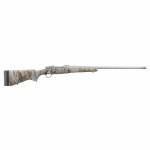 Caliber: 6.5 CREEDMOOR Handed: Right Rate of Twist: 8 Weight: 5.65 lbs Overall Length: 39.25-40.2" Barrel Length: 20" Ammo Capacity: 4 ..
Howa 1500 7.62x39 20" MiniAction Rifle - MultiCam. Award-winning design features a 6" 10.2oz mini action that is 12% shorter that short-action, resulting faster reloads. 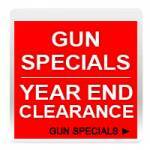 Includes a 5-Round detachable magazine. MultiCam. 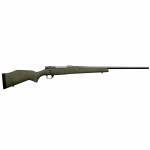 Howa 1500 barreled action 20" lightweight barrel Length of Pull: 13.87" Overall Length: 39.5" Weight: 6.6lbs Forged, lightened, one-piece bolt with two locking lugs Two-stage HACT trigger Three-position safety Sling swivel studs HTI pillar-bedded stock..
Axis rifles by Savage Arms are affordable without sacrificing performance. The Axis XP rifle features a modern design with silky-smooth bolt operation and a detachable box magazine. 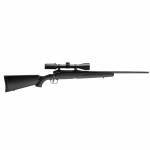 This model comes with a mounted and bore-sighted 3-9x40mm scope and an adjustable AccuTrigger. 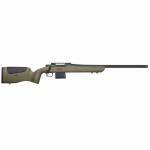 Action :Bolt Caliber :.30-06 WIN Barrel Length :22.0" Capacity :4+1 Trigger :Accutrigger Safety :Three Positi.. Cold hammer-forged barrel results in ultra-precise rifling that provides exceptional accuracy, longevity and easy cleaning. Ergonomically pleasing stock has rounded contours along the barrel, on the bottom of the stock and on top of the pistol grip and wrap-around checkering on grip and forend. Hinged solid-steel floorplate for easy unloading without having to chamber each cartridge. Features an engraved FTW logo and patented latch that is flush..
A day will come when we need to pull off the toughest shot we’ll ever face. Maybe it’ll be a whitetail breathing on 200 B&C inches. Or perhaps a bruin with a head the size of an 8-gallon keg. When that day comes, you can count on me to deliver. I am a Range Certified Vanguard and I come with official paperwork from the Oehler Ballistic Imaging System. The certification includes specific load/ballistic data and a computer image of the actual 3-shot group I fired at the Weatherby range. It’s signe.. Using many of the same features and designs perfected in the Christensen Arms Ridgeline, the Mesa was created as a premium, yet accessible lightweight rifle with a featherlight-contour, stainless steel barrel and a carbon fiber composite stock. Weighing in at only 6.5 pounds (short action) and carrying the Christensen Arms Sub-MOA Guarantee, the Mesa is the perfect rifle to carry deep into the backcountry. 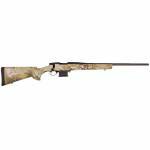 Right Hand Bolt Action 308 WIN 4+1 22" 416R Stainless Steel Barrel with a Fe..